After the freezing temperatures this week, it's hard to imagine what a perfect day we had for Kirk and Lindsey's engagement session. We almost cancelled because of a threat of thunderstorms, but I am so glad we met up. The sunlight was golden, the trees were beginning to change color, and these two were perfect together. They even brought their own blanket to snuggle under! Lindsey contacted me several months ago after seeing my page on Facebook. Sounds random, I know, but social media really works! After meeting her and Kirk for coffee, we instantly clicked, and I am thrilled to be photographing their wedding next summer. Scroll down to see some lovely images from their engagement session and hear a little more about their love story. Kirk and Lindsey met five years ago at a friends birthday party, and after taking it slow for a few months, quickly realized how much they enjoyed being together. They love to cook, bike, hike, camp and cheer on Pittsburgh sports teams (especially the Buccos)! 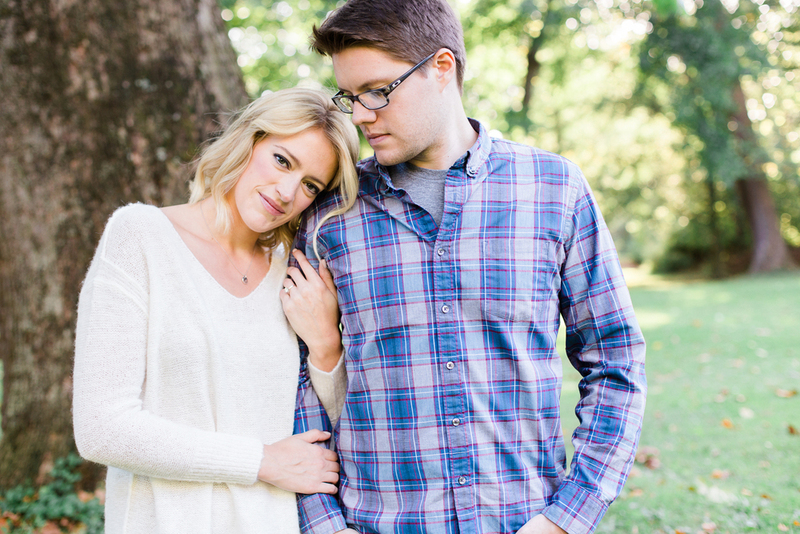 Here is a little more from Lindsey about the proposal: "Kirk's proposal was perfection. It was July 5th, very close to my birthday, and I thought we were meeting friends at a local Mt. Washington bar. Kirk thought we should walk to Grand View to take pictures and as we stood there, he got down on one knee and proposed! Then I saw our mutual friend leaping across the street with her camera in hand. She photographed the whole moment. We went to the bar/restaurant to meet friends for my birthday and, to my surprise, he had reserved the whole upstairs and had our closest family and friends waiting! He asked everyone to bring me a bouquet of flowers. It was amazing!" Kirk and Lindsey thank you so much for finding this perfect park, and for inviting me to be a part of this exciting season of your life!